Frank Grzeszczak at International Yacht Collection sends word of a $1 million price cut on the 45.7m motor yacht Carpe Diem II. 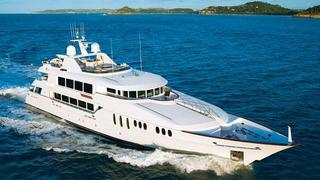 Built in 2002 by Trinity Yachts, she underwent an extensive refit in 2006. She can sleep up to 10 guests in five cabins and features classic interiors by Carol Williamson. Her two original Caterpillar 3512B engines give her a top speed of 20 knots and a cruising speed of 16 knots. Carpe Diem II is now asking $18.95 million, down from $19.95 million.